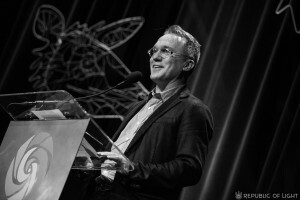 Joshua Sheridan Fouts is a globally recognized media innovator and social entrepreneur known for his visionary work paving new inroads for meaningful understanding between cultures. He is currently executive director of Bioneers, a 25-year-old NGO focused on practical solutions for people and planet. An anthropologist, Joshua has worked in both film and the arts. He began his career in Washington DC in the 1990s where he worked at the US State Department and experimented with new ways to use radio, television and Internet technology for cultural collaboration. He launched two first-of-their-kind think tanks focused on digital media innovation and cultural relations at the USC Annenberg School in Los Angeles, where he founded the first-ever blog about digital journalism and created a master’s degree in public diplomacy. For over twenty years in international and cultural relations, Joshua has worked with the peoples of Malaysia, Africa and indigenous tribes of the Amazon.